What kind of dead end pothole doesn't like to detour for good chow? Not me. When I want to merge great food and atmosphere, there's only one Avenue to take. They use Acme's sourdough wheat unlike most San Francisco restaurants (that choose the levain.) It's a nice change of pace to have this whole wheaty, sour, rustic carbo treat. Friendly and knowledgeable, the white and black clad wait staff do a good job keeping the large dining room flowing with yummy food and drinks. 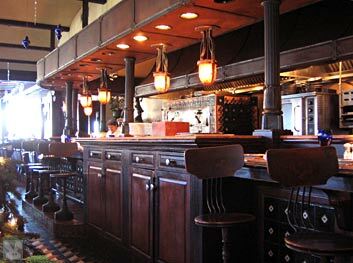 Atmosphere: Jeans or a suit are equally welcome in this gorgeous art nouveau dining room. There are intimate tables where two can sit abreast, larger areas for groups and a wonderful counter where you can see the cooks at work. The table settings are gorgeously understated and elegant. This was a wonderful combination of flavors. 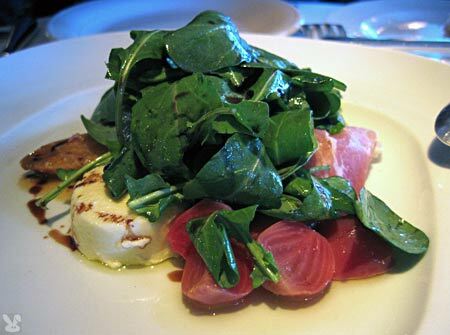 The warm, tangy goat cheese, combined with the sweet baby chioggia beets, peppery arugula dressed with a balsamic vinaigrette, pesto and paper thin slices of delicate la quercia prosciutto. The crostini and pesto added more crunch and dimension to this terrific starter. I hadn’t had prosciutto from this New York producer before. It was sweet, nutty and delicious. 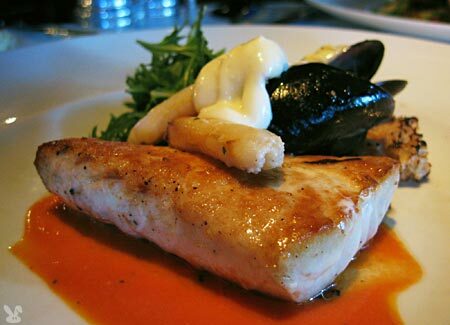 Pan roasted to a perfect moist doneness, this dense, white meat fish was flanked by bouchon mussels with a dab of aioli, sweet Dungeness crab, and grilled crostini. The high quality of the ingredients shone through in this unfussy preparation. Was cooked just the way I like it, moist with a hint of pinkness. When I had my first taste I thought that it was under-seasoned, but I had a second forkful with some of the bacon which rounded out the flavors and worked well with the thinly sliced Brussels sprouts, and pork jus. The mashed potatoes were streaked with chestnut puree which was combined with a bit of spud puree before being folded in to create savory, darkened, nutty streaks. I loved the combination of flavors and textures in this porky showcase. 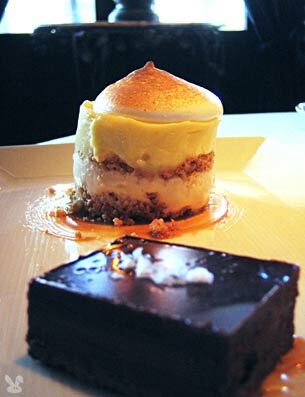 was a wonderful juxposition of lemon and chocolate. The puckery lemon curd against the graham cracker crumbs and scorched meringue teetered to the totter of bittersweet chocolate ganache topped with fragile pyramids of Maldon salt. Rich, chocolately, salty, puckery, smooth, grainy, sweet and bitter. This pilates for the tongue is just the sort of exercise I needed. 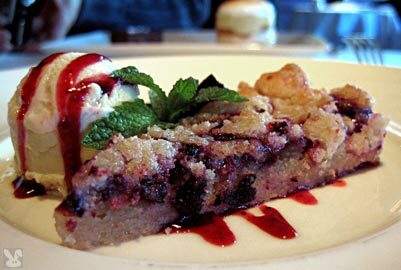 This blueberry cake is warmed to accentuate it’s crisp, buttery crust and crumbly topping. The jelloey pate de fruit and the smooth ice cream created another texturally diverse, beautifully executed dessert. 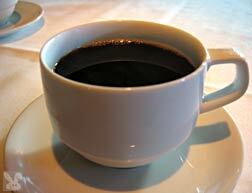 They use Peets beans and brew it to a perfect strength. 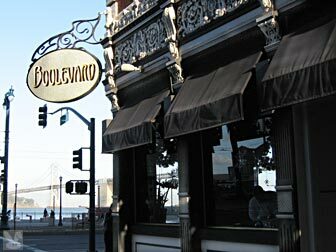 Boulevard is one of San Francisco's best restaurants. 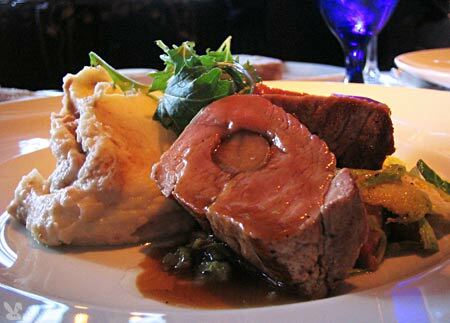 It employs top quality ingredients, fantastic chefs, a casual formality and plain old good sense. Great for a business dinner, anniversary or spontaneous lunch, they have somehow managed to stay fresh after over a decade of business. Go out the side door past the counter, cross the lobby and go downstairs. They keep the restroom clean and well stocked. The men’s room also has some pretty racy artwork, if circa 1925 turns you on.